Last month I spent several days in Austin, Texas, for SxSWi (South by Southwest Interactive festival). This year, I went with an examining eye, looking for how women would represent. … what I didn’t expect was to walk away with a new goal: to spend more time seeking out women I can learn from and find more mentors. I’ve attended a fair number of tech conferences through the years and I remember on more than one occasion, feeling a bit lonely and sometimes, dare I say it, a little out of place. At an O’Reilly Etech event a few years back, I recall getting my lunch and sitting down at the one lunch table that had an open seat. About six or seven men were around the table. Not one attempted to make eye contact or say hello. I attempted to make conversation but there wasn’t much interest. The next day I went and had lunch by myself in a nearby park – not very much like me at all. 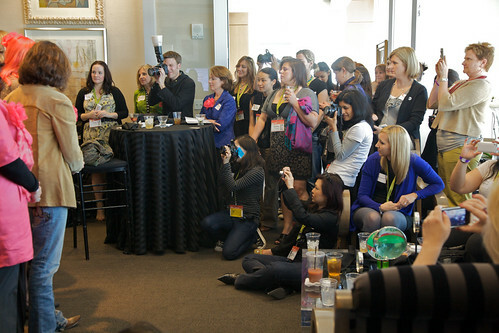 However, at SXSWi, from day one, I saw women (that I knew!) everywhere – in lines, panels, restaurants, throwing their own social mixers. While men still make up the majority, it was encouraging. During one of the days of back to back sessions, I decided to stop into a talk titled Smashing the Glass Ceiling (you can read my coverage of it here). When I first saw the title, I was hesitant about going. Sometimes I worry when I see “women’s panels,” as if women can’t talk about the same issues as men in a gender-mixed session. That worry quickly passed – the panel was great and reminded me that it is still critically important for women to carve out the time to learn from each other. The women of this panel carefully guided a room full of mostly women (and a few men) to talk about challenges and solutions. The bottom line: many women don’t feel the confidence they need to expertly leverage the changing business landscape. In a world of real-time tweets, non-stop conferences and highly connected social graphs, having a real gameplan and getting over fear of failure is necessary for success. While in Austin, a most inspiring friend and colleague invited me to a luncheon at a local office building. I didn’t know what to expect, but it ended up being a highlight of the entire week. There were probably 60+ women there to honor a few special women who have really done some amazing work. It was a quiet, intimate environment with room to spread out, talk and get to know each other. Everyone there had someone who had personally invited them, so we knew we were all connected in some way. The women we were honoring that day included creative raconteur of “Other Than That” Cathy Brooks, Altimeter Group’s Charlene Li, CNN’s Jennifer Martin, Read Write Web’s Jolie O’Dell, Facebook’s Randi Zuckerberg, Comcast’s Shauna Causey, Porter Novelli’s Stephanie Agresta and PGi’s Jackie Yeaney. One particular moment that stood out was when Jennifer Martin was asked to say a few words about herself and instead, went on and on about all the other women who really deserve the credit. Isn’t it so like so many women to divert attention away from themselves to honor someone else? First, it felt amazing to be surrounded by so many accomplished women. With so many men in our industry, it was inspiring and liberating to spend time talking with other women about their challenges and successes. Second, my ego and defenses took a rest. I often feel I’m fighting to prove myself. But in this environment, I felt comfortable letting down my guard and opening up to all of the knowledge that surrounded me. Since I’ve been home, I’ve been keeping an eye out for more local women I should spend time with and learn from. Serendipitously, I recently met a woman whom I would guess to be in her 60′s. We met in a completely social context and little did I realize this woman was a total pioneer, starting her own tech company in the early 90′s and exiting for a hefty sum just before the bubble burst. Sadly, I imagine a grey-haired woman wearing artsy earrings gets dismissed quite often by the tech or business world. But this is a woman I want to get to know better. This is a woman I can learn from. Remember to spend time with successful women whom I can learn from. Pick their brains – ask them how they do it. Remember to honor other women who are doing great work. Take time to celebrate together. Don’t pass up opportunities to get to know my female colleagues more personally and discuss my own goals and dreams. Look for mentors. I just saw that Kathy Korman Frey is starting a workshop on women and mentorship – what an opportunity. I never want to be dismissed, so don’t dismiss others. You never know what someone has to offer. The entrepreneurial mindset, from our sister blog, What’s Next, Gen Y? Regular contributor Jen Consalvo is co-founder of Shiny Heart Ventures, a new technology startup focused on building community driven products that remind people of the joys of life. For almost 14 years, Jen has led teams in a range of product areas such as digital imaging, social platforms and personalization. The majority of her career was at AOL, planning and building products used by millions of people globally. Also find Jen at jenconsalvo.com, bodysoulconnect.com and twitter.com/noreaster. Next post: Should Your Family Be Part Of Your Branding?